Gallery WM in a joint venture with Rypson & Blaton presents from July 24 to August 24, 2003 the exhibition ‘Sink’. If you go down to the cellar of the WM Gallery, you will find a sunken fairy tale. The Japanese painter, Mayumi Nakazaki, conjures creepy girls and pandas as if they’d stepped out from the pages of a children’s book. 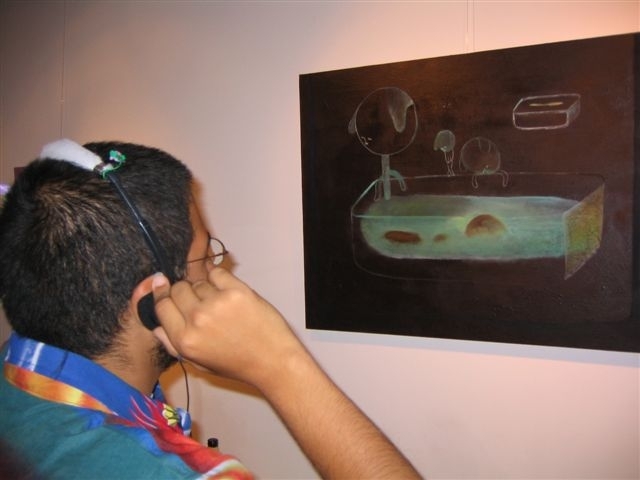 Next to the oil paintings are headphones, where you can hear the sounds recorded by Mickey Smid to accompany each image. “Every time I tried to bring out what was hidden in the paintings…” Nakazaki’s world is not the world outside the gallery, the modern world of buildings and cars. It’s not the world of TV. It is a world of shades: half-found images, floating girls held up by air, not legs. It’s a world rendered in a grainy, rain colour palette that hangs rounds the edges of tranquility. This is the path to old stories. Nakazaki works layer over layer until it’s right. The sounds recorded by Smid act like audio layers which transform the experience of the paintings. “It can have a strange effect if you put the sound of a crying woman over the painting of a red tree with a blanket. It becomes a different story and telling stories is the talent of Nakazaki and me. It’s what we do best,” says Mickey Smid. Open wed-sat from 2 till 6 – come, see and listen! 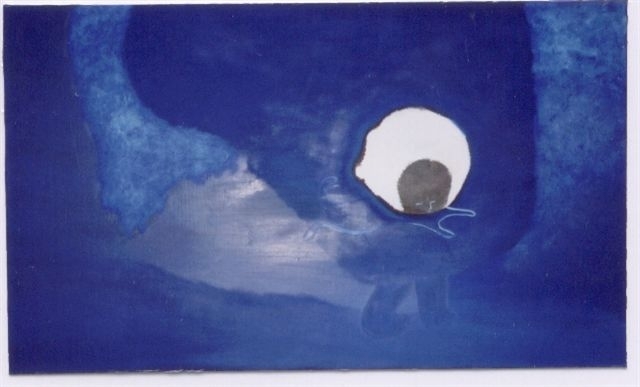 This is the painting ‘Blue’. Press play to hear the sound for it.